The Multifly is perhaps the most colourful species to inhabit SW City territory. It's large, colourful wings and bright body can be see flapping through the skies during the spring months. The color of the Multifly is almost always a very bright pink or purple. 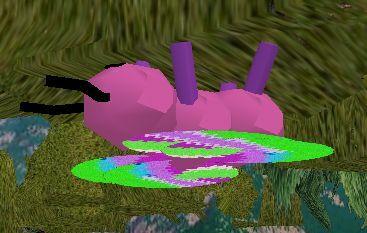 The wings can vary in color, from different shades of neon green, pink, purple and light blue. Their brightness will almost always give their location away but they can usually manage to avoid possible predators by resting on tall trees or rocks. These insects make a home in the largest forests on SW Island during the summer months to breed. A group of Multifly will often inhabit the same tree, eating it's leaves and sucking its sap. Some explorers who have come across a group of Multifly in a Kithicor Pine or SW'ian Redwood say that, under the weight of the whole group on the tree, it bends to ridiculous angles. Some taller trees, especially SW'ian Redwood, have been known to buckle under the weight of a group of Multifly and come crashing down. 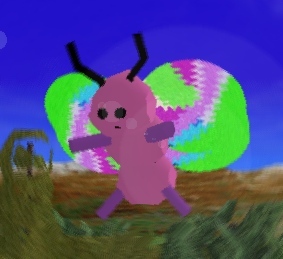 For the winter months, groups of Multifly have been tracked to migrate towards Pink Village and other western settlements. The Multifly plays a pivotal role in the blooming of the Mango tree in the southeastern Mango groves. When eggs have hatched, the infant Multifly will make it's way instinctively to the Mango orchards during the night time. Due to this fact, the infant Multifly is rarely seen. Hundreds of newborn Multifly will stay in a Mango tree for approximately 2 to 3 nights, feeding on the Mango tree nectar. In this process, it pollenates the trees allowing it to produce mangos. Once it is done feeding, it will wait till night-time to make it's long departure to an unknown area west of the Irenic Ocean. It is there that they stay until they are fully grown. Once they have reached their peak size, they begin their annual migration cycles. It has been debated by many SW'ian scientists about the actual classification of the Multifly. While it is classified as an insect, many believe it is a mammal because of it's tremendous size and mammalian body. It's current classification comes from the fact that it has many traits and characteristics that the common Swutterfly has. These characteristics outweigh the mammalian similarities and thus it is listed as an insect. Further links to mammals are still being researched and scientists believe they will change the classification.